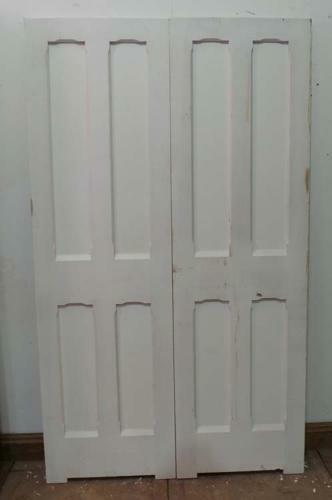 This lovely pair of Victorian Gothic style pine doors are workshop made and fully morticed and tenoned. Each door has two long panels, over 2 shorter panels, (probably MDF) with a decorative Gothic chamfer detail to both faces. These doors are NOT rebated. Please note: Individual doors are 23.35 inches (594mm) width each. All other measurements are taken as a pair. The height excludes construction horns. The doors are in excellent condition, ready for painting.